I have 3 Thermarest self-inflating mattresses. They all work fine and are durable. BUT... I recently bought an REI FLASH Insulated air mattress. To inflate it W/O getting my breath inside, along with gazillion microbes, I bought a Sea-to-Summit inflating dry bag. It also serves as my clothes dry bag so it does double duty. To use an air mattress properly one needs this inflator bag setup. Orally inflating it, especially at 9,000 ft. or more, would be a dizzying chore. The Sea-to-Summit bag fits my FLASH Insulated because REI thoughtfully made their valves to fit the Sea to Summit bag. The FLASH Insulated 3 season mattress has an R 3.7 insulating value whereas my twice as heavy Trail Pro has a R 4.0 insulating value. Not much difference. And REI has a "winter" FLASH Insulated mattress at R 5.2, sufficient until you reach -40 F./C. methinks. I use a TAR NeoAir XLite, R=3.2, 12 oz, and an original Instaflator cut down by a couple of feet to inflate. If it's going to be really cold I have a no-name dimpled z-fold CCF to add to it. i have one but rarely use it. 1x closed cell ridge rest in the summer, 2x in the winter. r value 2.8 per pad, i think. not the lightest weight and certainly not the most packable solution, but their durability, price and failure rate (essentially zero) are hard to beat. Your breath introduces moisture into the mattress, which can build up over time. Maybe not so much a problem with NeoAirs, but it can ruin a mattress with synth or down insulation. That's the voice of experience. I realized what was happening to my first inflatable, a Big Agnes, as I started to feel the cold ground through it. I should have known better. I ran it through the drier partially inflated then forced out the hot moist air a bunch of times but the insulation was still clumped. 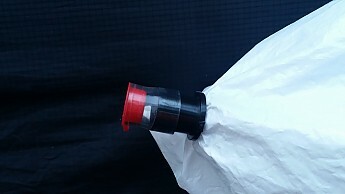 We use NeoAirs now with a plastic bag type inflater -- much faster, but I would go so far as to say that you should never inflate a fill-type insulation mattress with your breath, any more than a few finishing puffs anyway. And deflate when warm. Any photos of these set-ups? I'm testing a two-person pad right now and it's biggest drawback is that it is not self-inflating. I have a battery-powered pump, but it is heavy and not practical to carry into the backcountry. I'm toying with the idea of trying to track down an Instaflator (like the one LoneStranger reviewed), but not sure that is ideal. My review of the NeoAir AirTap has some photos. Works for me! A 5.2 R Value will get you no where near -40 comfortably. Exped's downmats are a 5.7 R value and they advertise comfort to only -11f. I do believe they use a conservative rating (much the same as someone like western mountaineering is warmer than advertised) but thats a huge difference in temps. Balza.. What Big Red said regarding making the insulation in an insulated air mattress wet (and bacteria-laden) by oral inflation is why I use that inflator bag. For sub zero temps to -10 F. this winter I may take a thin (3/16") closed cell underlayment foam with me "just in case". I'll be using an LL Bean -20 F. down bag with that REI FLASH Insulated air mattress. Should be plenty warm. Jake... Yeah, I agree that at -40 F. I'd need my TR RidgeRest under the FLASH Insulated mattress. Unless I make a trip to North Dakota with a friend of mine in February I'll likely only see -20 F. at the lowest. Here's hoping for some big snows In Dec. and Jan. so I can build a nice "snow kitchen" for cooking and lounging. And I may take my pulk instead of backpacking in. A few logging/mining roads will help me get to 9,000+ feet. As a quilt user, for deep cold I prefer to use two pads, Eric. I will use a Trail Pro under or over a BA insulated. The bottom one insulates you from the cold and the top one insulates you from the bottom one. Works best with inflatable underneath so you don't feel it bottom out as you roll over. two closed cell foam pads have taken me to -30 with a -40f rated mountain hardwear down bag. i hesitate to say 'comfortably' because that's really cold - worst bathroom breaks ever - but i slept soundly and warm. Hee, hee, "...- worst bathroom breaks ever -..." Yeah, exposing "The Boys" at those temps can be downright dangerous. But Nature "calls" at the worst times. But back to adequate mattresses for deep sub zero temps, I have slept in -22F. BUT it was in a quinzhee snow shelter which was amazingly warm, 25 F. at the lowest. In a double wall mountain tent I've slept comfortably in -5 F. a few times. This winter should be even lower temps at the 9,000+ ft. altitudes. I've bivouacked at -15° in a zero degree sleeping bag on a 2.8 r-value CCF pad. It wasn't comfortable, but the sleeping pad was definitely not a source of that discomfort. I think r-values of sleeping pads are pretty nebulous: depending on the material of the pad, it may or may not have to insulate you against the air temperature (as with air mattresses). A CCF pad only really has to insulate against the ground temperature, which is much warmer once the ambient weather drops much below freezing. Here's a couple of options from my older setup. 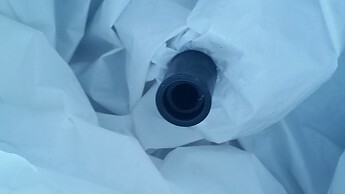 The port is just shoved through my compactor bag liner into a larger tube with a tight fit. I don't actually punch a hole in the bag until the two tubes are seated together and I have tested that they don't leak. Then I just punch a hole with a screwdriver or pen down the tubes and thought the bag. Depending on the valve size you can add another tube as needed. My current setup is just two short sections of the clear tubing pictured above nested with the Compactor bag between them...the two sizes make a snug fit. A quick shake of the Compactor bag and short breath fill it with air. Two of those fill my luxurious Nemo pad is full...used to take 20 breaths. I need to take photos of the new setup sometime. 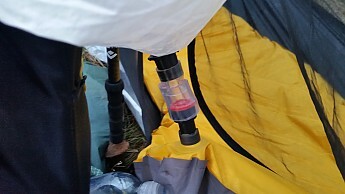 Phil, Thanks for the info on an inflator bag setup to fit the Thermarest valves. I'll try it. I may have to PM you for particulars. Balza, Actually my Sea to Summit inflator dry bag is exactly that, a dry bag for my clothes. So it's not "extra weight", it just replaces two smaller dry bags and doubles as an inflator bag. That's the essence of UL backpacking, having gear serve more than one purpose. @Phil, great photos and helpful insights. Thanks so much! I've been on the hunt for the Therm-a-Rest NeoAir AirTap that BigRed posted about, but I keep striking out. Nothing at my local gear store. Nothing online. So I contacted Therm-a-Rest directly and they said the product is discontinued and I should purchase the NeoAir Pump Sack instead. I realize products come and go, but it seems like Therm-a-Rest is limiting its customers inflation options. I.e. take a battery powered pump or take this 40L sack. Both options are overpriced and add much more bulk to my pack than the simple and small AirTap with a plastic bag. Looks like I'm back to square one and will be building a DIY version of the AirTap. Went on a short ski camp this week and found my Sea to Summit inflator/dry bag was perfect for stuffing my bulky Eddie Bauer PEAK XV belay parka - with only 1/3 of the bag volume used. The EB parka is a true -40 F. baffled down parka, EB's warmest and almost identical to the Patagonia Fitz Roy parka. So I was able to make the inflator bag serve a dual purpose which is the HolyGrail for backpacking gear. BTW, that Eddie Bauer parka is truly an amazing buy on a sale from the original $499. down to $299. Excellent design and construction. That parka made it feel like I had "insurance" up there at 9,500 ft. as the sun set and temps dropped. Pad technology continues to advance. I like the old Thermorest base camp for everything but backpacking. Just got a new Nemo Tensor which is 3 inches thick and pretty warm. My Dad used to say that "for cold weather, a large Sunday newspaper will insulate you from the ground." We used to go hunting in late fall and we always brought a bale of straw to sleep on. It was warm and very comfortable. Experience that some time and you won't forget it. Don't forget some insulation for your dog to sleep on, especially on snow. This forum: Older: Trekking Pole Recommendation For ... Newer: Automobile reviews?